Prepare for your future with a human resource management degree from SMWC as an on-campus student or in our online degree program. With a human resource management degree, you’ll develop the confidence and determination to become a key factor in administering your organization’s staff. This program’s curriculum is fully aligned with the Society for Human Resource Management’s HR curriculum guidebook and templates. We are among only a handful of programs in Indiana which acquired this honor. This means as a graduate of this program, you will be eligible to apply for the SHRM Certified Professional (SHRM-CP) exam, a great way to start your HR career! A human resources degree from SMWC, available on-campus and online, requires at least 125 credit hours. 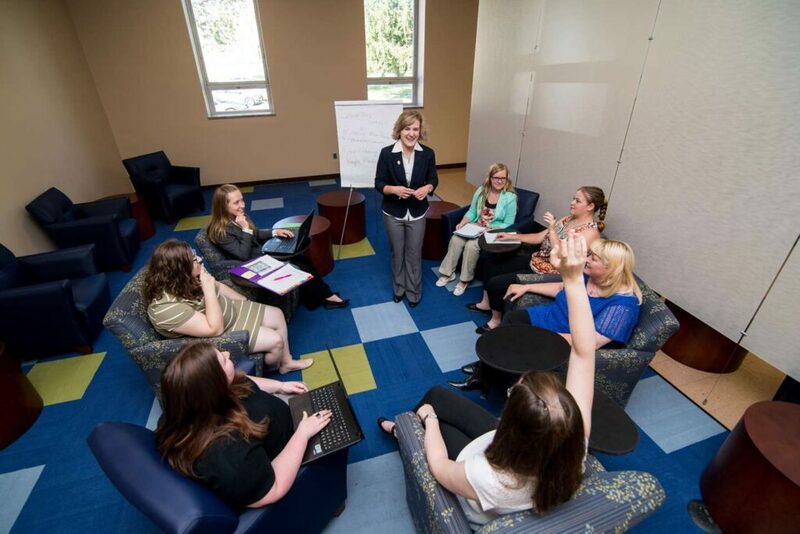 In addition to the general studies courses and electives to graduate as a SMWC human resource management major, you need to complete at least 48 credit hours in business and human resource management related courses. 21 credit hours required; All courses listed. Goes beyond the basic foundation of human resources management to focus in more detail on resources management in terms of implementing compensation, providing economic, physical and emotional security for employees, creating a productive work climate, understanding employee rights and discipline, strengthening employee-management relations and understanding global enterprises. Campus: Fall, odd years; WOL: October. Prerequisites: BU 241 and BU 341. Covers various legal issues that will face those employed in the human resources field. Some of the topics which may be covered include: compensation issues, equal employment opportunities, affirmative action programs, introduction to OSHA, employment and medical testing, sexual harassment issues, employee rights to privacy, as well as some specific laws such as ADA and NLRA. Campus: Fall, even years; WOL: October, January. Prerequisites: BU 241 and BU 371. Covers current readings and current and directed topics in the field of human resources management that are not covered in other classes. Topics will change as the field of human resource management changes. Every other year. Prerequisites: BU 341 and BU 342. Examines the research process in business. Provides the student the opportunity for in-depth exploration of a special area of interest. Campus: Fall, even years; WOL: October. Prerequisites: BU 241, BU 251 and MA 253. 6 credit hours required; All courses listed. Surveys the fundamental principles of macroeconomics. Provides a working understanding of the economy as a whole, noting interrelationships among concerns of contemporary society, world affairs and government fiscal and monetary policies. Campus: Fall and Spring, every year; WOL: March. 12 credit hours required; Choose four. With our general business core, you will develop your ability to manage a broad variety of corporate challenges, while specific HRM coursework shows you how to think conceptually about the dynamic world of management.